Every one of us believes that lifestyle-related diseases cause blood clot. Yes, the blood can get viscous or greasy. That's bad, but what causes it? Your whole body up to your blood vessels plays an important role in maintaining life. 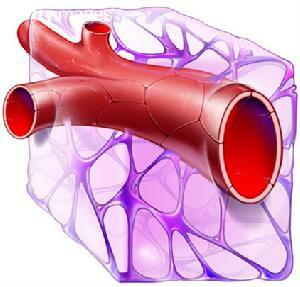 Blood vessels carry oxygen and nutrients to cells throughout the body. It plays a critical role in wound healing, and fight against pathogens that can invade the body. In other words, our blood and blood vessels is a lifeline of our body. When that lifeline is cut off, it can cause potentially life-threatening problems. Excessive drinking, obesity, lack of exercise, sleep deprivation, smoking, and stressful lifestyle can make the blood sticky. At this point of time, if left untreated, you will certainly have big troubles with your health soon. A sticky blood causes less capillary blood flow. Then, the surrounding cells will be killed because of lack of nutrients. Gradually, cholesterol deposits will form on the inner surfaces of the arteries that supplies blood to the heart or brain, further obstructing the blood flow. 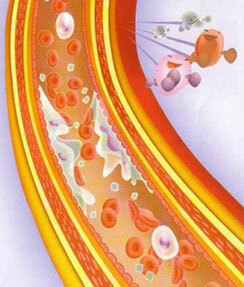 This is an early sign of atherosclerosis, and it is the major cause of stroke and heart attack. Since lifestyle is the biggest factor of blood clot, you have to find its remedy right away. Well, what kind of lifestyle that makes you more prone of sticky blood related diseases? Those who eat more meat products. Those who are serious in doing diet control to avoid getting fat, especially middle-aged female. Those who eat in fast foods daily. Those who always eat snack or junk foods. Those who drink liquor often. Those who have too much work and stress. Of course, the best way to start is through controlled intake of food. Fish, oats, vegetables, vegetable oils, and foods with less salt and sugar, and enough water every time will help your daily life. Tomato, Onion, Broccoli, Apple, Avocado, Orange, Mushroom, Kelp, Vegetables, Beans, Tofu, Milk, Fish, Shell, Vinegar, Mayonnaise, Sesame oil, are recommended. Vitamin B1, Vitamin B2, Vitamin B6, Vitamin C, Vitamin E, Niacin, Taurine, Magnesium, Chrome, Potassium, Vegetable fiber, Folic Acid, Carotene, Linoleic acid, Oleic acid, EPA, DHA, Polyphenol, and Mucin. What kinds of food are recommended daily? Now, here they are. Bell pepper, Red beans, Avocado, Almond, Squid, Octopus, Shells, Sardine, Seafood, Tofu, Olive oil, Squash, Agar, Cabbage, Milk, Cucumber, Black beans, Sesame, Rice bran, Bitter melon, Sweet potato, Tuna fish, Mushrooms, Potato, Vinegar, Celery, Soybeans, Onion, Tea oil, Red pepper, Tomato, Eggplant, Onion leaves, Carrots, Garlic, Broccoli, Oranges, Molokheiya, Yogurt, Apple, Seaweeds, and Kelps. When you have symptoms of Hyperlipidemia (excessive fats in blood), High blood triglycerides, Diabetes (high blood sugar levels), Obesity, and Hyperuricemia (Gout), think of your lifestyle at first. Of course, when you are sick due to negative energy, then it is hard to cure by diet and exercise alone; you may need the PYRO-ENERGEN therapy.